A couple of months ago, I received an email from a reader (Alisha) requesting a tutorial on this amazing braid from an awesome Instagram account called "@Arwelin" (which I believe is Russian.) I decided to take on this challenge, and after some trial and error, I think I have the braid decoded (but still not 100% sure this is the same technique used in the original photo.) Over the past couple of weeks, I have noticed this same braid popping up all over hairstyling pages on Instagram, Facebook, and Pinterest. It is becoming quite popular and I am certainly not the first to figure this out! 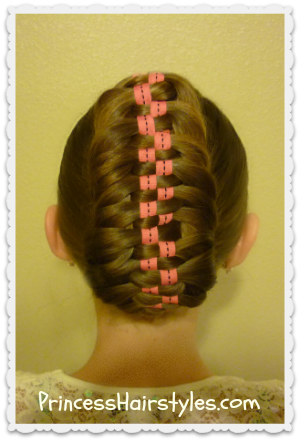 At first glance, this braid looks quite similar to the 5 strand checkerboard braid we did a couple of years ago. But I'm pretty sure this particular braid is actually made using an "inside out" or dutch fishtail braid technique and is quite different. For simplicity sake, I chose to show this braid in a ponytail (which should be fairly easy to learn.) With a little more practice and difficulty, this same braid can also be turned into a French (or Dutch) braid by incorporating hair from the sides into the braid. 1. The width and texture of the ribbon makes a big difference in how this braid turns out. I would recommend ribbon that is more on the stiff side rather than flimsy. Also, if you choose ribbon that is super thin or super thick, the braid is going to look completely different. You can experiment and find the width you like best. 3. You can use more than 2 strands of ribbon in the middle for an even more intricate braid if you want! In our video tutorial below, we show 2 hairstyles that can be made using this braid. A ponytail, and an updo. 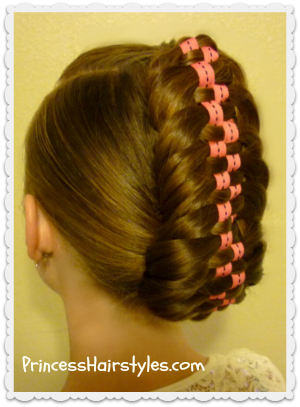 Of course, the possibilities are endless in the designs and hairstyles that can be created after you master this braid! 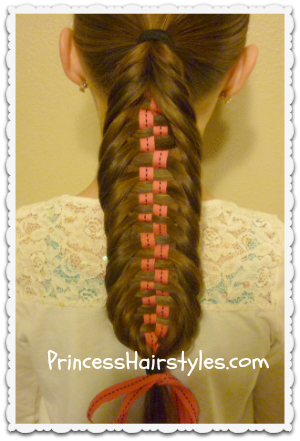 Checkerboard Fishtail Braid Video Tutorial: Click here to watch the video directly on YouTube.